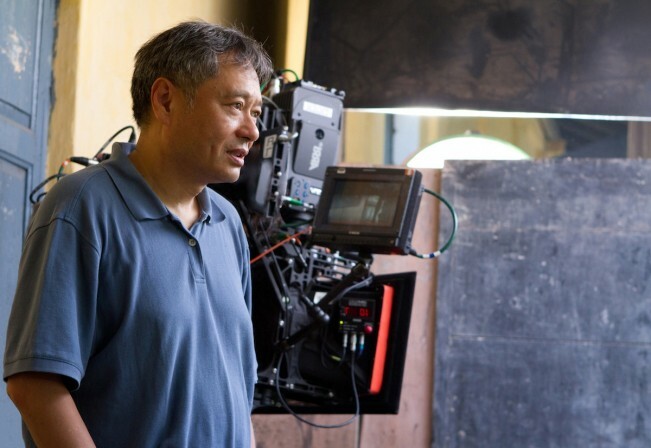 A couple days after its first exposure in New York City to outside audiences, Ang Lee traveled to several cities to introduce and talk about Life Of Pi. Down the stream would be his second Oscar for Best Director and, as of March 11, a $599,162,614 theatrical gross (80% of which would come from outside of the United States). We talked in October 24, 2012 at the Chicago Waldorf-Astoria, largely about images, water and weather. PRIDE: How dare you! You’re not supposed to make a film that’s beautiful in every frame. The eyes need some rest. LEE [laughs]: Thank you. It’s very challenging. PRIDE: There are so many kinds of physical beauty in the film. Nothing looks ordinary. Each setting, from a childhood his Pondicherry, India, to the many, many days on the water, even the grown-up Pi’s apartment in Montréal, have only as many specifics as a storybook. LEE: I’m glad you say that. That wasn’t actually my goal; I can’t make a visual film. It never occurred to me. People say about the visual thing… I think: it has to be a movie about ocean, about India, so just naturally… I’m not even a visually trained person, I’m dramatically trained. Visually, I rehearse the scene before I decide how to shoot it. PRIDE: Not only storyboards, but pre-viz, a pre-visualization in motion? LEE: Yes. Maybe because I visualized it—because I had to—because it’s so expensive. I animated the whole ocean part before I make the movie, to raise the money. It’s totally different from every other movie I’ve made, maybe that’s why, because I forced myself to pre-visualize them. But people are saying to me that it’s beautiful, it never occurred to me. I was just making it! PRIDE: There’s a single sequence-shot in India, we see one candle. It moves out onto the water. 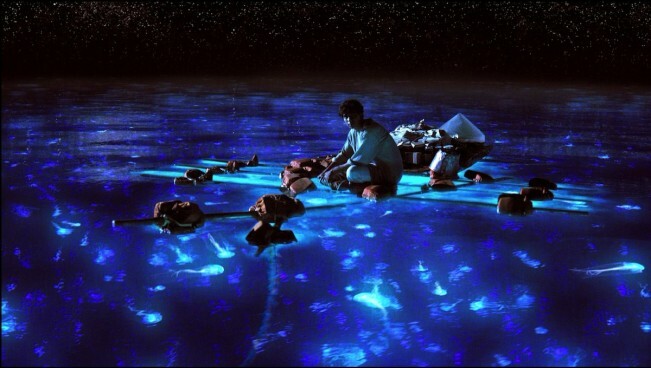 The camera tilts up, across the water, there are hundreds of candles afloat, there are hundreds of people on the horizon, and then there are stars, so many stars. Whatever part is digital and whatever part is real, it just feels like… you’re there. In a very particular place. PRIDE: There are rhymes of that throughout. Very early on, when Pi’s uncle is teaching him about swimming, seen from beneath, he seems to swim across the sky itself, plus it’s in the style of a French travel poster of the mid-century. Those colors! And later, after the shipwreck, Pi transfigured beneath the water, he’s stopped sinking, his arms are outstretched, he’s transfigured against the ship going to the bottom of the ocean. At that moment, it could be read as transfiguration, Christ-like, but you unify water and sky all the way through. LEE: You should be talking for me! [laughs] I wish I could articulate that like that. Well… Water and sky: I did make a point to my crew: I say I want to treat water like emotions. And sky is like life and death. What is going on on the water is death, but it’s liquid underneath, it carries lots of life, it’s where life begins. Sky is kind of death—heaven—so I wanted to echo anything to do with water, clouds, even mist, that shows life, therefore emotion. Whereas clear sky is spirit. Death. [Lee gestures with his hands.] Life… and death. So I did make that one point to my crew, but nothing beyond that. It’s just visual inspiration. You have nothing, you have no dialogue, you have to do something! PRIDE: I laughed out loud at one shot with my friend I was with, and she asked “what did you see?” and you have the island spilling over with meerkats, and you have the sound of [hungry tiger] Richard Parker foraging through the forest of meerkats. And over here in the corner you have one meerkat that’s holding up this fish skeleton almost its own size and it’s this great thing, because if you perceive it, the meerkats harvest and forage other creatures as well. LEE: Yeah, all the meerkats, if you watch a second time or third time, a lot of them are doing something. The visual team is so unusual, they don’t do blow-up things, effects where things blow up, so they are very into it. To put their own details, they are into it. LEE: You have to watch them not overacting! PRIDE: “The tiny meerkat over here, he’s overacting, stop him! ” But in the end you say you are trained in drama, and the film is essentially a two-hander. When Pi is telling the story as an adult to us, but also when he is on the ship. Two characters have to discover and establish boundaries. It’s a simple drama that could’ve taken place in a room. LEE: Yeah, except that the story he is telling is visualized. You cannot tell this in a room. 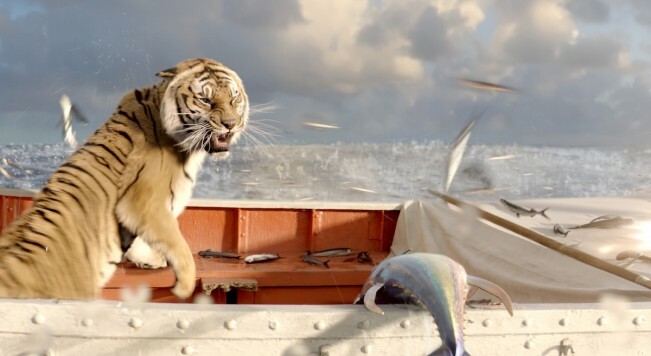 PRIDE: Right, but between Richard Parker and Pi, it’s a two-hander. PRIDE: When you have a stage drama, a chamber drama and it is just two people on stage. If you went to London in the West End and the drama is just two people talking. That’s a two-hander. LEE: Well, It is a strange thing, you think the ocean is vast, [but] it reminds me of Westerns, American Westerns. The backdrop is a vastness, but it’s actually it’s a very enclosed drama. I see Westerns as dramatic piece[s], the same way as this. You’re actually imprisoned in a very small compound. Very compact: drama is about conflict. You put people in a situation, it’s a very compact situation and they explode. So this is no different. They live on the boat, not the ocean, with very little space. PRIDE: When a character says “It’s an Indian boy, with a French name, and a Japanese freighter, on the way to Canada,” it’s almost like you’re describing the movie itself: an American film, shot by a Taiwan-born director in India and Taiwan. I was impressed to see that when I read about it, you built the tank entirely in Taiwan. You knew about the banyan preserve from your own experience. PRIDE: Which I am told that is what the novel tells you. LEE: Yeah. Let’s say, if you go for the second premise—which I hope nobody does. I am sure somebody… That means the first is a made-up story. How is it made up? It has to come from his life experience. So I think I want to find the floating island. This is not in the book, but I just figured it has to be something related to Indian plantations. But it should look similar but not the same, so I found this Taiwanese banyan tree which is different than India’s [laughs] and not many people know that. And I have to dress it up, I have to alter it. PRIDE: How cautious did you have to be about things becoming “statements” or overtly philosophical? There is a great line, “We were both raised in the zoo by the same master,” and of course you take that bigger, I mean, that’s all of us. Animals, humans, there is some master we don’t know who it is, or who we choose it to be. LEE: The master. Yeah. Now we are facing the master. I think the audience still needs to know, no matter how smart they are, you need to remind them that our intention is not just one single adventure story. There is a philosophical point to it, there’s a spiritual point to it. You have to remind them, but I try to do the minimum, so the smart ones can get the [philosophy], and the regular audience, they’re enjoying it. So yeah, we’re walking a fine line. I think, by the way, that’s the hardest thing. That line was written in post, it’s not in the script. PRIDE: That comes as a voiceover, right? LEE: It’s a voiceover; half of the voiceover was done in post. LEE: Yeah, a little voiceover, here, there. You change the voiceover to do this and that. It’s a constant weighing. It’s not like I had it planned and three years to execute my plans, it’s not like that. It could develop, it could find new obstacles and things that [cause] struggle. It’s a hard thing to do. If it’s just arthouse, a cheaper movie. I don’t have to work that hard. On the surface it has to be an adventure story, and then you are telling them another story. How do you do that with a sort of regular audience? PRIDE: This is full-blown Fox production, isn’t it, it’s like the international side of Fox said, “Yes, we like this, please do it”? LEE: I hope so, I hope so. Sometimes when somebody else writes a movie or a book about India, it’s an ideal place in the far distance, but for Indians they are home! So I hope there is a foreignness in this film about India, an abstract idea. Nobody owns a zoo in India for example, but because it is a movie I try to make it as realistic as possible. I think I wouldn’t be on the book, because you have to see it. And not just living in your imagination, how people behave, how things happen, how they look. I try to be as authentic as possible, but after all it’s just something else. It’s the material, a story about ideas. And I hope that they get it. PRIDE: The city’s so cold in wintern and has amazing brutal architecture built in the 1910s to withstand the cold. It’s the coldest place I ever want to go. It’s 40 degrees below zero in February! And summer has fierce mosquitoes this big! But, oh, “it’s a new life!” Winnipeg. LEE: And also with Indian accent, “Winnipeg” sounds funny. LEE: Yes, confidence of a continent. Very clever writing, it’s directly from the book. LEE: I chose that, because it’s not like you have to understand that line, it’s bluffing… “Ohh can I have some fun?! C’mon, please can I have some fun?” It has that flavor, it’s one of the few places I used the flourish and the music I use is something like out of The Adventures of Sinbad. PRIDE: If you have an audience of geologists they would be saying “but continents move so slowly! Is this movie getting slower?” But I don’t think that many geologists are going to be critiquing. Other directors had considered the film, did you pursue it? And is there an image or a sentiment, we’ve been talking a little bit about the layers, the necessary layers for you to want to make it. But was there an image or a sentiment that said, “I know how to tell this story with water and children and animals! I’m getting excited!” Was there just some thing? Because you had a number of really beautiful visual specific images, the ones I’ve been describing back to you. But was there something when you read this that just went, click, I want this. LEE: Not when I first read the book. I just found it… it was a very good read, but it was not a movie to me, because you cannot make those images. That was some ten years ago… but when I started thinking about making the movie, of course, I thought about working through the water, and then reflections. Water is both reflective and transparent. I’m into the reflecting and transparent material. I think it’s magical; you can do a lot of statements with it. I started out doing that with The Ice Storm. I used a lot of reflective [things] seen through ice. So I am into that kind of thing. But also because it’s reflective, you can see the camera too, and it caused many troubles, and with 3D you have polarization problems. For a movie, people don’t shoot water in 3D. It hits anything reflective, to the left to the right differently. We solved that problem. Our stereographer created something that just you slide the camera and it solved that problem. Something we had to do in post, it’s trouble, but because of that trouble, that’s why not many people have done it. So usually trouble is good for filmmaking. You might have the chance, if you go through the trouble, maybe you make something exciting. PRIDE: A technician, a 3D person, a stereographer would go “wow,” but the average person wouldn’t know because they’re watching the story, ideally. PRIDE: They don’t know about these problems because they are invisible, they have been solved. LEE: Something filmmakers have to watch, all filmmakers, is that film basically works not like books: it’s very direct, it impacts you directly, it’s photorealistic images enlarged, and somehow it has to be realistic-looking, and somehow because the demand on attention is mandatory, it works on a emotional level, a philosophical, the ideas don’t translate in a movie. It has to have emotions. So you that’s different from the book quite a bit. So it has to be an emotional journey, people take an ocean ride in the movie; there is not much you can do. PRIDE: There is a great thing in movies when you are very specific about what is around us in nature. Whether it is the wind and water. We all have our own experiences, the weather is universal, but what we take out of it as symbol or emotion, the filmmaker can’t predict. You are providing this, but everyone has a different take. Even just physically, let alone religion or other concerns. It remains endlessly interpretable by people because it’s the weather, it’s water. LEE: To me, I think that to me, it’s an visualization of feelings. That’s why you are doing it. Movies or any art is external stimulus, they don’t carry anything. They just stimulate, and it’s not about stimulating me, all that really matters is you, the viewer. So I’ve learned a lot from incomplete pictures, a lot of times with test screenings that involve friends and family to see how they react. It’s very confusing, this movie, some movies you put out exactly [as you plan], but this movie is very confusing. LEE: The sea, water is the beginning of life. It visually does carry emotion, especially 3D. It feels more real than 2D, with 2D I have to do a lot more to impress, but here, even with six-foot waves already, you are feeling it. Then you have to make it come towards you, I don’t know how to describe it, I feel that I cannot do this in 2D. It’s just the water elements. PRIDE: The scale of it looked really good, because in older movies it’s always comically wrong. Especially is you go back to a great movie from 1937, History is Made at Night. There is a lot of water in it, including a sinking ship. And you can tell the water drops are like this big. And even CGI, when technicians first started crafting it, you’d always hear, water, you can’t do water. We can’t do water or fur. LEE: It’s very hard to do. Of all the elements water is the hardest. The method of making movies is something else. Just technically water is harder in animation I think. It’s very hard to figure out. And also how we photograph them, this is really technical, because digital images, it shows what it is. It’s not how you see it in your mind’s eye, and then you have to adjust to your experience, including badly-shot water scenes. Sometimes they all grow on you, it’s a habit that you associate with water, so I have to make an adjustment to the mind’s eye, so to speak. PRIDE: I’ve always thought that no matter what the movie is, wherever it is set, any movie could end profitably with the last scene ending by an ocean or a lake. Like the story continues life. It’s just endlessly suggestive. There was a thing that Godard said that I remembered when I saw Ride With the Devil the first time, it was one of Godard’s early epigrams, he said something like “Since D. W. Griffith, we’ve forgotten the wind and the trees.” [Lee laughs.] And yet… you said something along these lines a minute ago, weather and these phenomenon are a way to do what you can’t on the page with explicit descriptions. “And then Ang thought, the wind in the trees!” Whereas in the movie you have to do it with body language, or the weather. LEE: I think nature is a great tool to visualize internal feelings, I am dramatically trained, not visually trained. All of these images come from what I need to express how the characters feel. It all came from there, hardly anything is purely visual [in a way] that I cannot explain why it came to me. It’s not like that. Because you feel peaceful, so you have this, it feels loss, so he has that. 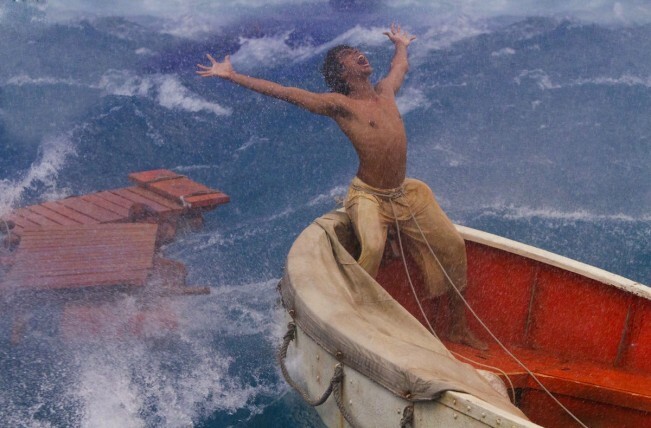 In turmoil, so you have the storm. It’s all about something. PRIDE: So what you are doing is crediting yourself for having come up with the images but they have come to you through your thought process about dramatic feeling. LEE: Yes, that is how I work, I admire people who just envision something. For no reason, like the pen takes their hand to draw. My older son is like that, just drawing, I don’t know how people do that. To just draw. I am not like that, I am drama. PRIDE: Across your career is there anyone you have worked with so consistently except [writer-producer James] Schamus and your editor Tim Squyres? LEE: This time without Schamus is the first time, but I still work with Tim. Tim didn’t do Brokeback Mountain and James didn’t work with this one. LEE: I don’t have many, actually just the two of them. It’s a good thing, sort of your anchor. And also these days people probably imagine I know what to do, which is not true! They’ve known me from day one, so they still give me direct feedback. PRIDE: And now the feedback of reviews. LEE: About a month ago I was filled with anxiety. Now not so much! Transcription assistance by Julie Gavlak. 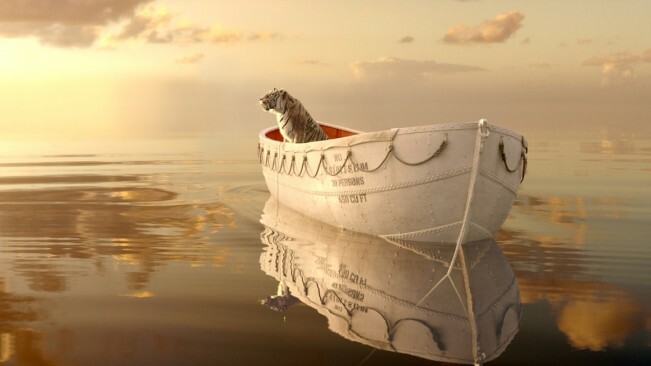 Life Of Pi is available for digital download and on DVD and Blu-Ray March 12, 2013.